Helpful info on Do It Yourself grad studies, because you gotta do so much of it by yourself… But you’re not alone…! Then I remembered that if I learned anything from the dreadful period of the comprehensive exams, it’s that stressing out (to the point of freaking out) doesn’t do you any good, unless you have just the right amount of stress to keep you focused and healthily efficient. So I decided to go for a run for the first time in a while. Wasn’t it raining this morning? Sure, but it’s Vancouver. Whatever. It ended up being a very refreshing run around the campus followed by the realization that “Hey, I could do this every morning” (I’m kidding. Every other morning seems closer to practical). The weather is warm enough that you won’t be too tempted to go back to bed after stepping out the door. 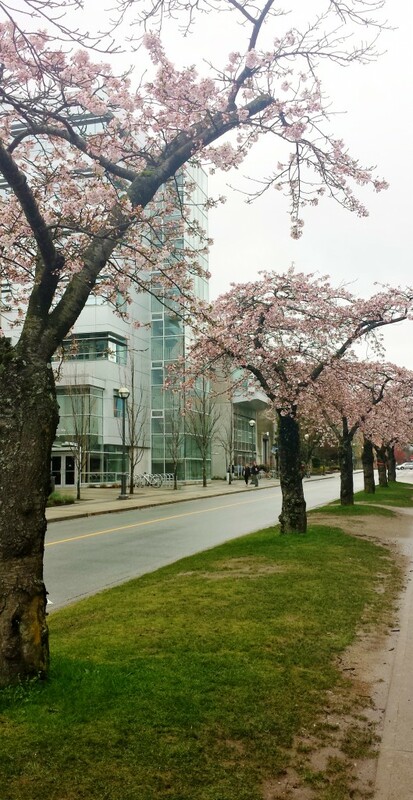 And the campus is going through a very rapid transition between seasons, and bringing that awesome Vancouver spring scenery at its full speed. It’s hard to complain about residence prices on campus (yes, they raised it by 2% again this year, yikes!) when you can walk out the door and right away be greeted by an abundance of good jogging routes with fresh and clean air from the trees of the Pacific Spirit Park and the waves of the ocean, far far away from streets filled with the sound of cars passing by. And today, running up and down the main mall (distance: a tad bit shy of 3km from the Thunderbird Cres. to Rose Garden and back) I was greeted by all the cherry blossoms that have bloomed and starting to decorate the streets. Beautiful…! 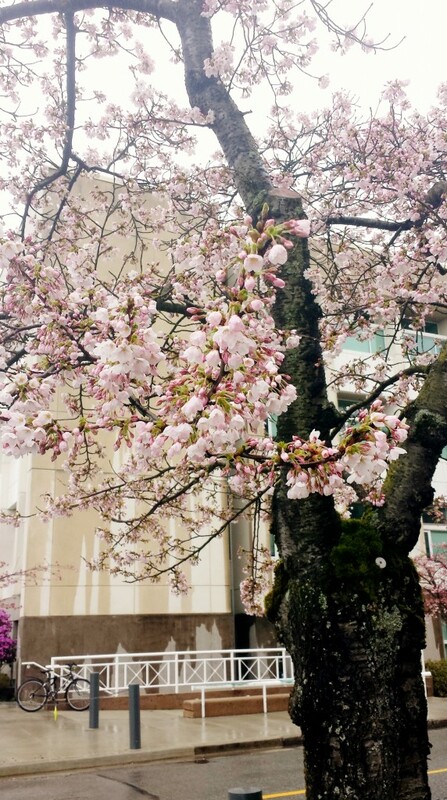 This entry was posted in The Alchemy of Stress to Happiness, The Weather Here on March 29, 2014 by AJung. Another amazing comic by PhD Comics. Life of a grad student involves getting excited over access to free catered food (because that’s a huge upgrade from free, yet slightly too cold pizza), hunching over computers or weird complicated looking instruments most hours of your day, and avoiding writing about what you’ve been hunched over and working hard for so long by means of procrastination (e. g., hours of video gaming for some, and mad crocheting of hats for others). These probably accurate descriptions of daily lives of most grad students are not necessarily the most glamorous part of grad school. The glamour comes when you finally fight the demons of procrastination and communicate what exactly that weird instrument you’ve been working on is all about, or why the colourful graph on your computer is making you (and probably your advisor) so excited — and yes, labeling the axes of your graph really really helps in this process. If you don’t communicate what you’ve found, then the world won’t know anything about it, and that would be a tragic way to let your hopes and dreams of changing the world go down the drain. Practically speaking, for those of us in our respective doctoral programs, publishing our research findings translates to career advancements. Journal publications typically have more weight when it comes to you playing that ‘when are you graduating?’ game. But when it comes to conference publications, that actually means fully funded (sometimes) international travel, and the privilege to present your work to the people who might actually want to know more about your work. In the Department of Mechanical Engineering, there seems to be a hidden rule of thumb where if you’ve published more than a couple of journal papers, then your committee can’t really hold you back from adding the Dr. title in front of your name. So it may make sense to you that you should aim to publish journal papers, journals papers only, and pump them out fast. But while that logic may work if your goal is to graduate quickly, it may not be the best of ideas if you are hoping to land a dream job after graduating, build a strong network of people you can collaborate with in the future, or make your research heard (literally & figuratively) to the people in your field. I mean, at the end of the day, advancing science, contributing new knowledge, helping to figure out how this world works.. these are the reasons why you’re hunched over your computer all the time, isn’t it? Well, maybe not for all of us, but you know. Conferences are where you find like-minded individuals who ‘get’ what you’re talking about, even when you haven’t even finished giving your elevator pitch. It’s also the place where friendship kind of emerges naturally, in a rather long-distance sort of way, because you get what they’re doing also — and that’s an amazing thing. Another funny comic by PhD Comics. And yes, I think I know with a high level of certainty that more people read my blog posts than academic publications. Conveniently, Google Analytics tracks my Holy S#*% score. Last week, I was in Germany attending the International Conference on Human-Robot Interaction 2014 (HRI’14). Even before I got to the conference venue, I ran into two of my “friends in research” from Switzerland and Japan at one of the tram stations. I had met them at two different occasions, one at a conference held in the Netherlands, and the other at a different conference in San Francisco (well, through twitter first, but whatever). Although I had met them separately at different times, they somehow knew each other and were sharing a hotel room. When I got to the conference, I met my old roommate from a couple of years ago when I was attending a summer school in Germany. Then another person from that other workshop, that other conference, etc. You get the point. These are all people that I connect with and can have hours of great, interesting, sometimes research-related and sometimes personal conversations with. These are also people that I would hang out with on Skype from time to time, or send them Christmas cards to, because they are awesome and dear people to me. Back in the days, I thought that was just that. I care about my research, and I would be happy to tell you all about it, but other people probably don’t want to bother getting to know the details of my work. I’m happy to get to know other people, learn from them, make some new friends, and enjoy the travelling portion of my work while I’m at it. So, I had one of the most amazing moments of my research life when I found out that my paper I presented at a conference a handful of years ago had really made an impact. A PhD student came up to me at the conference last week, and said that he’s happy to finally meet me because his research is inspired by the work I had presented in the past. He had an abstract of his work written and everything, citing the work that I make fun of myself with all too often. I make fun of my work because I think it’s funny that years of my work is about this seemingly tiny little human phenomenon of hesitation and how implementing them into human-robot interaction context can be useful for getting robots to work with us better. Hesitations, seriously? But then, yes, yes, I know! Someone else is also talking about hesitations in HRI now. How exciting! I probably sound like I’m bragging about my research. But that’s not my intention. The point here is that I had nothing to do with the impact my work had — I’ve been totally oblivious about this effect. I just published what I had worked on, and the paper kind of took on a life of its own. In a very passive and serendipitous manner, it brought some new or different ideas in someone else’s mind, and was already swirling into something different, perhaps bigger and more exciting. This post became much longer than I intended, but I hope it inspires those of us trying to fight off that writer’s block or procrastination demon and motivates you to start typing out that paper. Now, go. Type away madly. Beautify that amazing figure — and label those axes. At some prestigious conference somewhere awesome, you’ll be the expert to present the amazing results. Who knows what impact that will have? This entry was posted in Conferences etc.,, Thesis, Comprehensives, Papers, (Rant) on March 16, 2014 by AJung. Earlier today, I wrote a rather long post for you thinking that sharing the details of my experience of having gone through the GKE process will help you feel better. But then, I remembered that no matter what other people said to me, I heard it, and nodded, but didn’t believe what they said. Before having written the exam last year, I felt that everyone else is smarter than me, so even if they say it’s “easy”, it’s not going to be easy for me. Same went with a lot of other things people had to say to me too. Everyone seemed to be just saying things because it’s really not their problem, and they just want to say stuff to make you feel better. Hence, I know that even if I were to post the very long essay I’ve written for you, you’re probably gonna be like me and not take it seriously. 1. Everyone wants you to pass. It’s true. Numerous people have told me this, and I didn’t take this seriously, but it’s true. If you don’t pass, then that’s more of your time wasted, and none of the professors want to see you do that. They want to see you spend time doing research and contributing to the research world, because that’s what really matters in academia. So it’s not the pass/fail that they (your supervisors as well as the department) care about. It’s your productivity that matters to them more. So seriously, EVERYONE wants you to pass, so that we can all move on to doing things that we are here to do in the first place — change the world with awesome research work! 2. No one wants you to go through the oral exam. Professors who will be conducting the oral exam are the ones marking your exams. These professors are really busy individuals who have a lot better things to do than to spend the time to schedule an oral exam with you, and to sit with you to discuss the basics of things that they are already an expert of. These exams don’t produce publications. Conducting these exams mean less sleep or less time spent with the family for the professors. So when they are marking the exam with the very ambiguous “pass / marginally pass / fail” system, they have very good reasons to want to pass you the first round. 3. Even if you end up having to go through the oral exam, you’ll be fine. This goes back to my point #1, but let me give it a different light. People who will be conducting the oral exam are department colleagues of your supervisor(s). If you go through the oral exam, your supervisor will know who will be conducting the oral exam and making the pass/fail decision. And as close colleagues, the examining professors inevitably want to avoid creating the uncomfortable situation with your supervisor by failing you — thereby wasting more of your time, and hence, draining your supervisor’s one of the most important research resources. 4. Even if you fail the written and oral exam, you’ll still be fine. Again, no one wants you to fail, nor get kicked out of the program. Here’s why. Your supervisor has already invested at least half a year’s worth of research fund on you. In academia where funding can be tricky to secure, no one wants to see that much money go to waste, which would be the case if you were to fail and be asked to leave the program. No one really gets kicked out of the program (a very very very few gets kicked out). What happens if you fail the oral exam is that they ask you to take certain courses in the upcoming term to make sure you have basic knowledge in a particular topic. So they want you all to be here, all passed and headed towards candidacy. 5. And this too shall pass. When I was stressed out of my guts during the GKE period, a very wise professor told me that “This too shall pass”. It felt like it never would. But it did. This is just a temporary, despite probably unpleasant, period in your academic career that will soon be forgotten. And you, my dear, will be fine. Just remember to breathe, and take it from someone with experience that stressing out really doesn’t help. If it helps, MEGA has planned a party for you to celebrate your end of GKE for Jan. 31st. So you know you already have something to look forward to. Best of luck, and see you all on the other side. This entry was posted in Thesis, Comprehensives, Papers, (Rant) on January 24, 2014 by AJung.